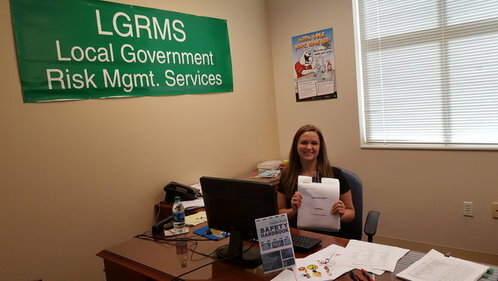 Lauren Kelly, an English major at the University of West Georgia, completed an internship working within the Office of Risk and Safety for Douglas County as part of the 2016 Summer Georgia County Internship Program. Kelly, throughout high school and two years of college, volunteered with Douglas County’s Explorer program which allowed her to gain experience with the Douglas County Sheriff’s Department. However, she was not as familiar with county government departments and went into her internship eager to expand her knowledge of county government. Kelly’s main duties were editing and revising the Safety Manual. She organized chapters as well as set up the format for printing. Kelly also performed the editing and revision of several forms of the Office of Risk and Safety in addition to those of other departments. She found her favorite part of the internship to be editing the Safety Manual and working with the printer to help set the final product. Kelly also enjoyed communicating with other departments to determine what policies should be included in the manual. Kelly expressed that her greatest success of the internship was seeing the final copy of the Safety Manual that she had a hand in creating which would assist county employees in staying safe at work. She also said completing the document helped her develop professionally as she plans to move into the editing and publishing field. After completing her internship, Kelly noted she would absolutely consider a career in county government based on her time with the Office of Risk and Safety. She voiced that she learned much about her desired field and thought the entire experience was incredible.